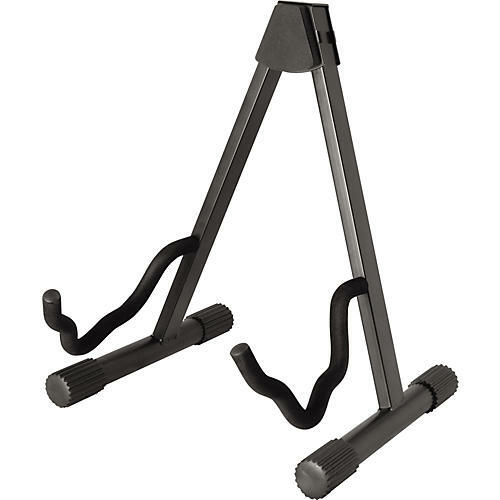 Stand holds either acoustic or electric guitar, mixer, or combo amp. On-Stage's strongest A-Frame features heavy-duty square tubing, velveteen rubber and a "uni-construction" design which means that there are no parts to lose. A patented stepped yoke holds both acoustic and electric guitars as well as desktop mixers and combo amps, so there is no longer a need to own multiple stands when our patented stepped yoke can holdall of them! The unique shape also allows this stand to nest together with others when not is use. Can't make up your mind which stand to buy first? No problem when one stand can do it all! Order a Universal A-frame stand now and sort it out later.